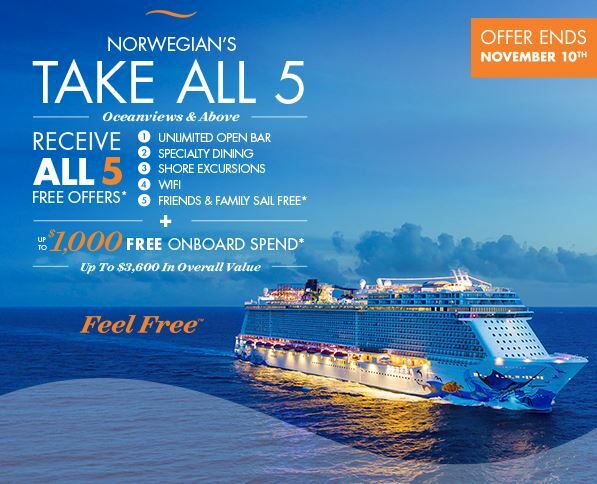 Norwegian's "Take All 5" Promotion is BACK, Nov 8-10 only! It's back!!! Norwegian's incredible Take All 5 sale — up to $3,600 in overall value. What’s more, enjoy up to $1,000 on-board credit plus reduced cruise deposits. Talk about having it all! But hurry, this is a limited time opportunity, November 8-10 ONLY , so don't delay!